I’m home! I thought it would be appropriate to write about the Philippines while I’m in town. It’s been 2 years since my last trip here. A family occasion gave me the opportunity to visit home this close to Christmas. I surely miss the vibrant colors, vitality and noise of the streets filled with jeepneys. I miss the company of friends and family. I am currently at a local coffee shop right in the heart of Metropolitan Manila’s business district – Makati. Like so many others, I come here mainly to connect to the internet and the coffee is just secondary. I am part of a Shared Services organization based in Florida. Due to a scheduling conflict, I am tasked to work during the first two weeks of December even though I am in a different time zone (13-hour difference). Indeed, technology has broken the barriers to work and collaboration. Something that – decades ago – one can hardly imagine doing. I work nights (usually until 1am) to catch-up with the US Eastern Time zone. It is not as if I am the only one working the night shift in Metro Manila and in many major cities in the Philippines. I am comforted by the fact that I work at the same time as thousands of service agents and consultants providing services to the US and Europe. 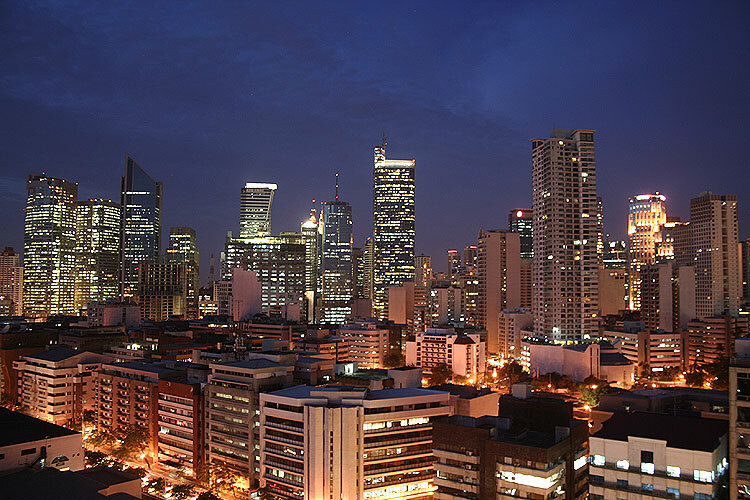 In Makati, it is pretty common to see heavily lighted high rise buildings at night. After all, the Philippines is one of the main centers of business process outsourcing (BPO) and shared services in the world. The Philippine BPO industry provides a wide portfolio of services that not only include traditional voice and IT services but also higher value services such as finance, IT programming, engineering, medical transcription and architectural services. According to Tas, J. & Sunder, S. in a journal entitled Financial Services Business Process Outsourcing published in 2004. BPO can be categorized into two types—front office and back office outsourcing. Front office outsourcing is typically related to customer services and contact center services while Back office usually refers to support and administrative functions such as human resources, finance and accounting. Based on service location there are two types of BPO—Nearshore and Offshore outsourcing. For example, relative to United States, BPO service providers in Mexico can be considered a nearshore outsourcing as compared to BPO services provided to US companies from Asia Pacific countries, like the Philippines. Amid the global economic crisis, the BPO industries in the country have remained strong in 2009. Industry experts in the Philippines expect 35% growth this year. According to the Business Process Association of the Philippines (BPAP), the biggest organization of outsourcing providers in the Philippines, the outsourcing industry will earn about $12 billion to $13 billion and employ close to 900,000 people in 2010. The Philippines has remained one of the most ideal locations for companies who outsource business processes and services. Filipinos are known to be highly skilled, hardworking, dedicated and loyal. There is a known Filipino trait called “malasakit” (in local Filipno language) that means genuine concern and care. Filipinos are known to exhibit this quality in the workplace. Skills and hardworking attitudes guarantee strong performance and productivity, while on the other hand, dedication and loyalty translates to better talent retention, less training costs and experienced service personnel. The Philippines is also considered as the location of choice due to its less expensive operational and labor costs, as well as having an English-speaking workforce (the result of English being the main medium of instruction in schools and universities in all educational levels). The Philippines, with the help of the Government and private sectors, has also developed a competitive infrastructure in terms of telecommunications, information and technology. UK body proclaims the Philippines as World’s Best BPO destination for the 2nd time. The Philippines has won the 2009 Offshoring Destination of the Year category at the 4th National Outsourcing Association (NOA) Awards held October 15 at Park Plaza Riverbank in London. The Philippines bested Egypt, Malaysia, Russia and Sri Lanka among others. This is the second time that the country bagged the prestigious award category. The first time was in 2007. This was reported in a press release by BPAP last October 2009. A lot of top multinational companies have service centers in the Philippines—Caltex, Citibank, HSBC, Procter and Gamble, Deutsche Bank and Dell, to name a few. It’s common for an individual to have at least one close family member who works in BPOs and services centers. It’s just that so many Filipinos nowadays work in BPO-related industries across the Philippines. My new sister-in-law, for instance, works in HSBC service center and my brother used to work there too— it’s where they met. This goes to show that indeed, business process outsourcing, offshore call and service centers are now part of Filipino lifestyle of service. We are known for our service— not just in BPO industries but in many industries— not just in the Philippines but around the world.